The British public must not be "squeamish" about the prospect of sending troops to fight another Afghanistan-style conflict, the Defence Secretary said tonight. 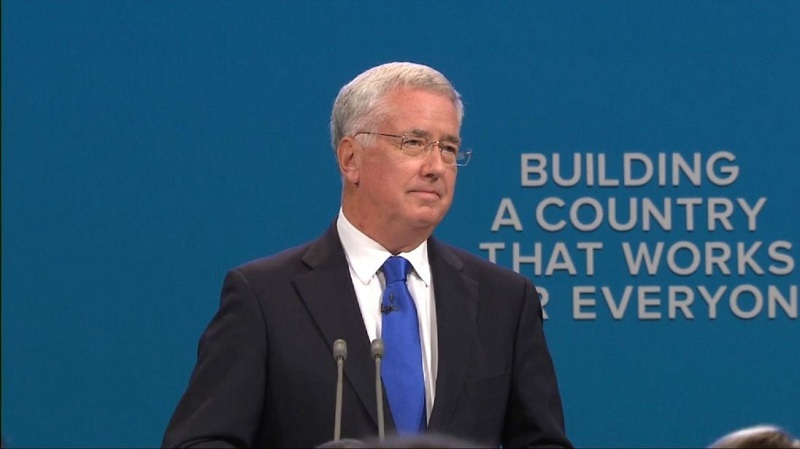 Sir Michael Fallon declared that the UK has the fifth biggest defence budget in the world and must be ready to "answer the call from fragile democracies". At an event on Tuesday, he did not rule out sending British soldiers to conflict zones, three years after the UK's gruelling 13-year intervention in Afghanistan ended in a handover to local forces. When combat operations ended in late 2014, after the loss of 454 British lives, Sir Michael said soldiers would not be returning to the country "under any circumstances... we've made that very clear". But he told a fringe meeting at the Conservative party conference: "I think we have learned from the campaigns in Iraq and the long campaigns in Afghanistan that in these particular situations the battle has to be won by local forces that have the support of the local population. "I don't think it follows from that we should say to ourselves we are never going to deploy combat troops ever again. "I think that is far too sweeping and I think we need to be ready to prepare our public. "We have the fifth biggest defence budget in the world, easily the most professional army in the world, the most respected. "If you have this and you are asked to help in a specific situation where there aren't those local forces then there may be circumstances in which we should be ready to do so again. "I do not think we should be squeamish about that." In August, Sir Michael welcomed Donald Trump's decision to beef up the US troop presence in Afghanistan, to prevent an al Qaeda takeover. The number of British military advisers in the country is being increased by 85, joining a base of around 500. Government sources said at the time that it was premature to talk about British combat troops being redeployed there, and that no requests had been made by the US although President Trump suggested NATO allies should provide support. Sir Michael said in October 2014 that while Britain had made military and political "mistakes" in the country since sending forces there in 2001, UK involvement had prevented it becoming a "safe haven for terrorism". At the event on defence policy, chaired by Sky News, Sir Michael was also challenged by former Tory defence minister Sir Gerald Howarth who said the "overwhelming majority" of the Tory party want more money committed to the Armed Forces. Sir Gerald, who was a minister under David Cameron, said: "I'm alongside those who have left the Armed Forces who believe that the budget is inadequate. "That is the view of the overwhelming majority of the people in our party. The budget is inadequate for the task that you face." The ex-MP for Aldershot warned Sir Michael that a National Security Capability Review, due to report by the end of this year, must not see troop numbers cut. He said: "We need more ships, more men and we do need adequate supply. I think the Budget has got to be increased. It should come from the [overseas] aid budget and you should look to the party to give you the maximum possible support."